These are the posts where I gush about some song that I’ve got a huge crush on at the moment, and you put up with it and listen because you’re a good friend. As an adult, I’ve tried to expand my musical horizons, which meant accepting that a song full of electric distortion or bloops and bleeps could, in its own way, be just as moving as one based on a well-picked acoustic guitar. But there’s a certain part of me that still thinks there is nothing better than when a musician truly rocks out using nothing more than vibrating strings, or takes something thoroughly digital and explores what it might have sounded like in an analogue world. 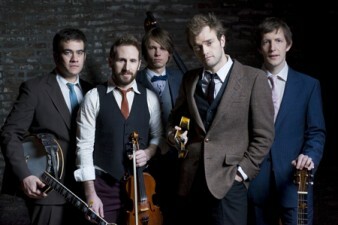 That part of me thinks Punch Brothers is without a doubt the coolest band ever. All of this would make for an intriguing experiment but not very compelling music were it not for Thile’s knack for writing pop tunes. The final track on Who’s Feeling Young Now?, “Don’t Get Married Without Me” features its share of unusual time signatures, unexpected modulations and experimental sounds, but at its heart it’s a catchy breakup song. Thile—on whom I’ll admit to having a bit of a man-crush every since I saw Nickel Creek at Lollapalooza—once again assumes his favorite persona: the self-aware, unapologetically blunt lothario. He tries to convince a girl that they’re not really in love and that she should feel free to do “whatever you like with whomever you like”—so long as it’s not permanent so that he can come back to her when he feels like it. It’s not any more convincing than usual—could anyone with a baby face and sweet voice like that really be such an icky jerk?—but it makes for a potent song, especially when grounded by Paul Kowert’s hard-hitting bass. Scroll down a bit to stream the song. There’s a player down there, but somehow Grooveshark’s embed code is interacting a little funny with my WordPress theme. Herbst Theater in San Francisco. Click for tickets. This entry was posted in Events, Music, Racking Up Plays and tagged acoustic, bluegrass, Chris Thile, covers, Herbst Theater, Nickel Creek, Punch Brothers, San Francisco venues, unplugged. Bookmark the permalink.